For other uses, see Gluttony (disambiguation). Gluttony (Latin: gula, derived from the Latin gluttire meaning "to gulp down or swallow") means over-indulgence and over-consumption of food, drink, or wealth items, particularly as status symbols. In Christianity, it is considered a sin if the excessive desire for food causes it to be withheld from the needy. Some Christian denominations consider gluttony one of the seven deadly sins. In Deut 21:20 and Proverbs 23:21, it is זלל. The Gesenius Entry (lower left word) has indications of "squandering" and "profligacy" (waste). In Matthew 11:19 and Luke 7:34, it is φαγος ("phagos" transliterated character for character), The LSJ Entry is tiny, and only refers to one external source, Zenobius Paroemiographus 1.73. The word could mean merely "an eater", since φαγω means "eat". 1. Eating before the time of meals in order to satisfy the palate. 2. Seeking delicacies and better quality of food to gratify the "vile sense of taste." 3. Seeking to stimulate the palate with overly or elaborately prepared food (e.g. with luxurious sauces and seasonings). 4. Exceeding the necessary quantity of food. 5. Taking food with too much eagerness, even when eating the proper amount, and even if the food is not luxurious. The fifth way is worse than all others, said St. Gregory, because it shows attachment to pleasure most clearly. To recapitulate, St Gregory the Great said that one may succumb to the sin of gluttony by: 1. Time (when); 2. Quality; 3. Stimulants; 4. Quantity; 5. Eagerness. He asserts that the irregular desire is the sin, not the food: "For it is not the food, but the desire that is in fault". 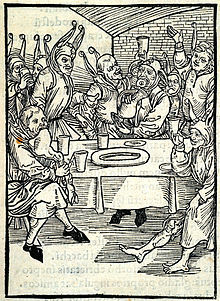 "Pope Innocent XI has condemned the proposition which asserts that it is not a sin to eat or to drink from the sole motive of satisfying the palate. However, it is not a fault to feel pleasure in eating: for it is, generally speaking, impossible to eat without experiencing the delight which food naturally produces. But it is a defect to eat, like beasts, through the sole motive of sensual gratification, and without any reasonable object. Hence, the most delicious meats may be eaten without sin, if the motive be good and worthy of a rational creature; and, in taking the coarsest food through attachment to pleasure, there may be a fault." The Sunnah encourages moderation in eating, and strongly criticizes extravagance. The Prophet said: The son of Adam does not fill any vessel worse than his stomach. It is sufficient for the son of Adam to eat a few mouthfuls, to keep him going. If he must do that (fill his stomach), then let him fill one third with food, one third with drink and one third with air.” Narrated by al-Tirmidhi (2380); classed as saheeh by al-Albaani in al-Silsilah al-Saheehah (2265). Deuteronomy 21:20 - "And they shall say unto the elders of his city, This our son is stubborn and rebellious, he will not obey our voice; he is a glutton, and a drunkard. Proverbs 23:20-21 - "Be not among winebibbers; among riotous eaters of flesh: For the drunkard and the glutton shall come to poverty: and drowsiness shall clothe a man with rags." Proverbs 23:2 - "When thou sittest to eat with a ruler, consider diligently what is before thee. And put a knife to thy throat, if thou be a man given to appetite." Proverbs 25:16 - "Hast thou found honey? eat so much as is sufficient for thee, lest thou be filled therewith, and vomit it." Luke 7:33-35 (and parallel account in Matthew 11:18-19) - "For John the Baptist came neither eating bread nor drinking wine; and ye say, He hath a devil. The Son of man is come eating and drinking; and ye say, Behold a gluttonous man, and a winebibber, a friend of publicans and sinners! But wisdom is justified of all her children." Callimachus the famous Greek poet states, "All that I have given to my stomach has disappeared, and I have retained all the fodder that I gave to my spirit." Popular quote "Eat to live, not live to eat" is commonly attributed to Socrates. A quotation from Rhetorica ad Herennium IV.28 : "Esse oportet ut vivas; non vivere ut edas" ("It is necessary to eat in order to live, not to live in order to eat") is credited by the Oxford Dictionary of Proverbs to Cicero. ^ "Strong's Search: H2151". Newjerusalem.org. Retrieved 2014-08-27. ^ "Hebrew and Chaldee Lexicon by Friedrich Wilhelm Gesenius". Tyndalearchive.com. Retrieved 2014-08-27. ^ "Strong's Search: G5314". Newjerusalem.org. Retrieved 2014-08-27. ^ "Henry George Liddell, Robert Scott, A Greek-English Lexicon, φάγος". Perseus.tufts.edu. Retrieved 2014-08-27. ^ "List of 613 Commandments". List of 613 Commandments. Retrieved 10 May 2012. ^ Shipley, Orby. A Theory About Sin, London (1875) pg. 268-278. Books.google.com. Retrieved 2014-08-27. ^ Susan E. Hill (2007). "The Ooze of Gluttony". In Richard Newhauser (ed.). The Seven Deadly Sins: From Communities to Individuals. BRILL. p. 64. ISBN 9789004157859. ^ Lori Barcliff Baptista (2012). "Gluttony". In Carl A. Zimring, William L. Rathje (ed.). Encyclopedia of Consumption and Waste: The Social Science of Garbage. SAGE Publications. p. 324. ISBN 9781452266671. ^ a b St. Thomas Aquinas. "The Summa Theologica II-II.Q148.A4" (1920, Second and Revised ed.). New Advent. ^ St. Alphonsus Liguori. ''The True Spouse of Jesus Christ''; trans. from Italian. Dublin (1835), p. 282. Books.google.com. Retrieved 2014-08-27. ^ Jaucourt, Louis, chevalier de. "Gluttony." The Encyclopedia of Diderot & d'Alembert Collaborative Translation Project. Translated by Sean Takats. Ann Arbor: Michigan Publishing, University of Michigan Library, 2006. Web. ^ George Alexander Kennedy (2008). The Art of Rhetoric in the Roman World. Wipf and Stock Publishers. p. 133. ISBN 9781556359798. ^ Giambattista Vico (1996). Giorgio A. Pinton, Arthur W. Shippee (ed.). The Art of Rhetoric. Rodopi. p. 181. ISBN 9789051839289. ^ Jennifer Speake, ed. (2015). Oxford Dictionary of Proverbs. OUP Oxford. p. 89. ISBN 9780191059599. Look up gluttony in Wiktionary, the free dictionary. 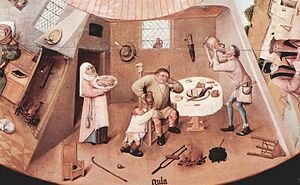 Wikimedia Commons has media related to Gluttony.